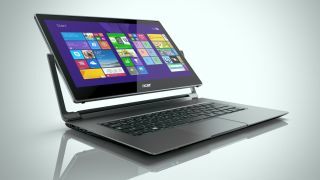 Acer has used the IFA 2014 expo in Berlin to unveil a pair of convertible Windows 8.1 laptops toting more positions than a Yoga manual. First up, the Aspire Aspire R 13 features a 13.3-inch, Gorilla Glass 3-equipped display that rests on what Acer calls an Ezel Aero Hinge, which allows it to rotate 180 degrees and into six different positions. We've seen similar hinges before on Acer products, including the Star Trek-like Aspire R7. You'll be able to choose between a full-HD (1920 x 1080) or HD (1366 x 768) display, along with a choice of Intel Core i5 or i7 processors for maximum grunt. Other specs include up to a 1TB SSD with RAID-0 support backed up by 8GB of RAM, and an optional Active Stylus Pen with palm rejection for doodling and capturing screen content. It measures 25.4mm thick and weighs just over 3lbs. The Apsire R 13 Series launches in the US in October starting $899 (around £546, or AUS$967), heading to European shores in November starting at €899. Continuing the theme of flexible hinges, the new Aspire R 14 features a 360-degree dual-torque hinge design that allows it to transform into four different modes. Like the Aspire R 13, it'll be available with a choice of Intel Core processors (i3, i5 or i7), up to 12GB of RAM and integrated NVidia GeForce 820M graphics, which is bound to capture the attention of gamers looking to frag on the move. The Aspire R 14 comes with a HD display (1366 x 768) that features Zero Air gap technology, and once again it's available with an Active Stylus Pen. The Aspire R 14 Series is due to reach US shores in October starting $599 (around £364, or AUS$644), and will land in Europe in mid-October, starting €499 (around US$656, £398, AUS$704). What else is going on at IFA 2014?